I sit here in my recliner watching tv while I crochet. I look over at my sweet husband. His once long dark hair and thick dark beard has now turned the colors of salt and pepper. He catches me staring at him and we both smile at each other, blow little kisses and wink. Then continue watching TV. He is still as handsome as he ever was. I have a gray hair in my eye brow and a wild hair on my chin. "I need to fix that", I whispered in the mirror. He peers into the bathroom where im standing, we give each other a wink and a smile. He continues down the hall. He doesnt even notice the new wrinkle I just found around my nose. I squat down to get a pan from under the lower cabinate. My knees don't cooperate as I struggle to get up. Before I reach for the counter, his hand is there to help me up. We look at each other and giggle, a stroke on the check, a wink and we carry on with cooking. His shoulder aches from years of working, I go to get him a tylenol. They were pushed somewhere between the daily vitamines and blood pressure pills. "Wheres the aspercream? He asks. "I dont remember where I put it", I said as I slipped on my glasses. He rolls his eyes, I shrug my shoulders and we go on a search. Found it. Its time for bed, our bones sound like popcorn as we make our way to the bedroom. Hes goes ahead of me as I stop to brush my teeth. He's hiding somewhere down the hall. He will jump out and try to scare me, then we will race to the bed laughing and giggling. We will lay there and joke about our day, fight over the covers and pick on each other before finally settleing down to go to sleep. We forget we are not 21 anymore as we tire out easily at the end of the day. As I scoot in close to him, I say, "awwwe we are growing old together", he replys with, "yep, just like we wanted to do" . Aw, such a beautiful post. This is love. I love it. One of your BEST! It can last forever! You could be writing about us. ALWAYS KEEP THAT FEELING! Life together is soooo sweet. I always find it strange to see couples with a 10-15+ year or more age difference. Almost always an older guy with a younger girl. 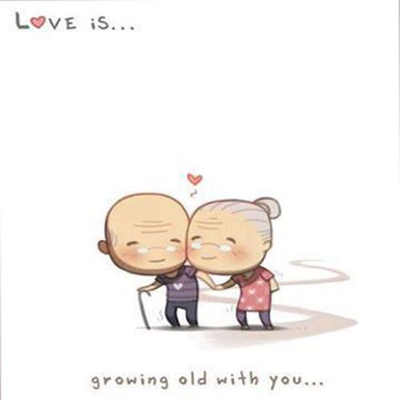 That's not growing old together, that's setting yourself up to be a widow. About 30 years from now they'll be some guy say "Hey Honey, remember when the Cubs won the world series for the first time in over 100 years back when I was in college" and she'll say "I was two". Daisy is about two years older than me, given that men live shorter than women but vegetarians (me) live longer than others we'll probably leave the world around a similar time. It is a shame we all can't just go in our sleep on the same night with our spouses when we're much older than the people older than dirt. Hes ten years older than me. ;) and just as healthy. Wow 57 years is awesome! I cant wait! we keep a pair of reading glasses on just about every table and counter in the house...you'd think it would be easier just to walk around with a single pair on our head...but no. Funny you say that. I have reading glasses all over the house and can never seem to find a pair when I need them. Oh that is so nice. I love it. How blessed we all are! !